Pentax has been a strong name in the burgeoning budget DSLR market for a long time. The Pentax K-m, for instance, is a surprisingly good 10.2MP camera that can be had for as little as £330. The £599 Pentax K-x continues in a similar vein. Indeed, hold both cameras at the same time and it's only the branding that allows you to tell them apart. Their outward specifications are identical - they're the same size and almost exactly the same weight, and they both have a 2.7-inch LCD on the back. The layout of the buttons on the back of the cameras is the same as well. That means all the changes are internal. 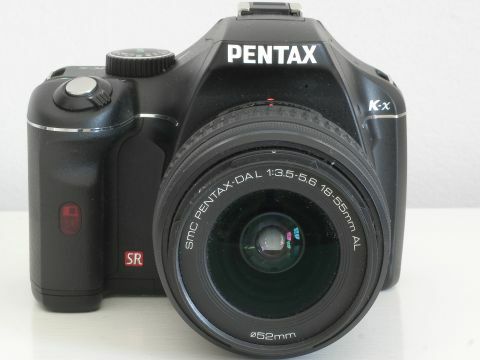 The K-m's PRIME (Pentax Real Image Engine) has been replaced by the PRIME II engine, and where the older camera has a 10.2MP CCD sensor, the new K-x has a 12.4MP sensor. It isn't just the pixel density that has gone up - the K-x's sensor is a CMOS chip, and that means the headline act isn't bigger pictures, but HD video. Like most of the HD-capable DSLRs we've seen, such as the Nikon D300S, the Pentax produces excellent quality video. It records in Motion-JPEG AVI format, like Nikon's HD-capable cameras, and you can choose from 1,280 x 720 (720p) at 24 frames per second or 640 x 480 (480p).